By Keith Cowing on March 18, 2016 10:42 AM. Keith's note: When I first came to Washington in 1986 I had the extreme pleasure of working with Thora at NASA Headquarters. Thora learned her craft from the very first people to send living things into space and I had the distinct honor of learning about those early days from her. She practically invented space biology. She was always fun to work with and had a soft spot when it came to young people. She was instrumental in the founding of ASGSB - now ASGSR - an organization which had the interests of students deeply embedded in its core mission. When budget cuts threatened many researchers she did her best to keep everyone's work alive and defended their interests like a mother wolverine. She was quite a pioneer - as a scientist and as a woman working at NASA at a time when few women had a chance to run large programs. 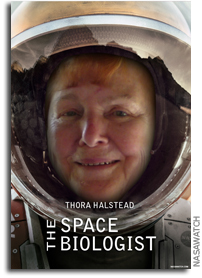 If anyone can be called a founder of space biology, it was Thora Halstead. Since the film "The Martian" strove for accuracy - and Mark Watney was a space botanist - then it follows that his thesis advisor's thesis advisor's thesis advisor owed something directly to Thora Halstead's commitment to advancing the careers of space biologists and students everywhere. Ad astra. "... One of those pioneers, Dr. Thora Halstead, passed away last week. Thora was a mentor to many, and her work benefited thousands. She's been credited with helping to establish the field of space biology before there was such a discipline, and the mentors of many of today's scientists working in the field can credit Thora with direct mentorship or inspiration. Thora's numerous experiments and more than 40 published papers explored how the cells of living organisms respond to a low-gravity environment. As we move closer to Mars, we see that work in many ways, from the VEGGIE experiment that has produced the first lettuce crop in space, or research to show us how plants communicate within their systems in microgravity. Thora also founded the American Society for Gravitational and Space Biology (ASGSB), a 500-plus member society with worldwide scientific community membership (now the American Society for Gravitational and Space Research). The legacy of exchange and collaboration that she began will continue to advance space biology for years to come." "She retired from NASA Life Sciences in 1994, where she was the Manager of the Space Biology Program; Life and Biomedical Sciences and Applications Division. Her numerous experiments and published research articles (more than 40) focused on the study of how the cells of living organisms respond to a low-gravity environment." Keith's note: When I first came to Washington in 1986 I had the extreme pleasure of working with Thora at NASA Headquarters. Thora learned her craft from the very first people to send living things into space and I had the distinct honor of learning about those early days from her. She practically invented space biology. She was always fun to work with and had a soft spot when it came to young people. She was instrumental in the founding of ASGSB - now ASGSR - an organization which had the interests of students deeply embedded in its core mission. When budget cuts threatened many researchers she did her best to keep everyone's work alive and defended their interests like a mother wolverine.\n\nShe was quite a pioneer - as a scientist and as a woman working at NASA at a time when few women had a chance to run large programs. If anyone can be called a founder of space biology, it was Thora Halstead. Since the film \"The Martian\" strove for accuracy - and Mark Watney was a space botanist - then it follows that his thesis advisor's thesis advisor's thesis advisor owed something directly to Thora Halstead's commitment to advancing the careers of space biologists and students everywhere. Ad astra.\n\n\"Women Have Always Been NASA Pioneers\", Dava Newman and Ellen Stofan\n\n\"... One of those pioneers, Dr. Thora Halstead, passed away last week. Thora was a mentor to many, and her work benefited thousands. She's been credited with helping to establish the field of space biology before there was such a discipline, and the mentors of many of today's scientists working in the field can credit Thora with direct mentorship or inspiration. Thora's numerous experiments and more than 40 published papers explored how the cells of living organisms respond to a low-gravity environment. As we move closer to Mars, we see that work in many ways, from the VEGGIE experiment that has produced the first lettuce crop in space, or research to show us how plants communicate within their systems in microgravity. Thora also founded the American Society for Gravitational and Space Biology (ASGSB), a 500-plus member society with worldwide scientific community membership (now the American Society for Gravitational and Space Research). The legacy of exchange and collaboration that she began will continue to advance space biology for years to come.\"
This page contains a single entry by Keith Cowing published on March 18, 2016 10:42 AM. House Science Committee Hearing on FY 2017 NASA Budget was the previous entry in this blog. Soyuz TMA-20M Arrives at ISS is the next entry in this blog.